The Twin Spin, created by NetEnt, has a similar design to the old-school fruit machine but the online slots reviews have it that it has newer tricks up its sleeve. What are the tricks? This fruit machine features Twin Reels which show exactly similar symbols. It can, however, expand to give the player up to five reels with one symbol and this can lead to potential payouts of about 1,080 times the stake on each spin. The five reels offer 243 possible ways to win and can be played on any device with stakes of between £25 to £125 per spin. 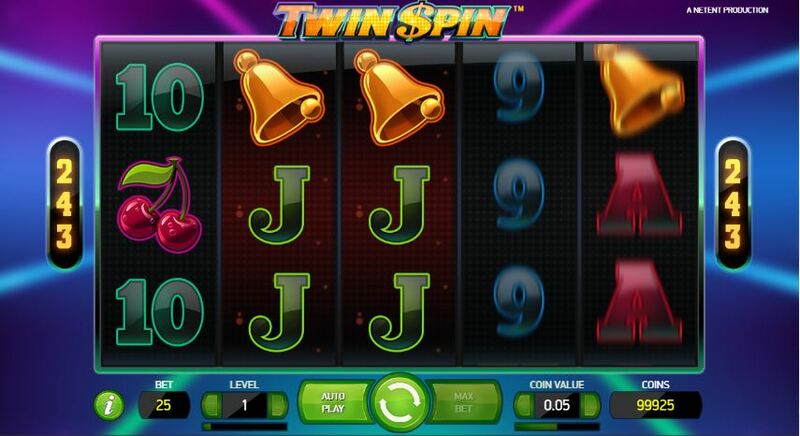 Twin Spin design is based on the classic one-armed bandit casino games. The symbols are similar to those of the common fruit machines in both offline and online slot games. They include the lower value A – 9 playing cards as well as the lucky 7s, bells, bars and cherries. The most valuable symbol in this slot game is the diamond that awards 1,000 coins for landing 5 on a pay line. There is also a wild that is able to land on the three middle reels and act as a substitute for all the other symbols. Players should note that before spinning the reels, they have to choose a bet. However, the game is available for the slot free play online on various sites offering slot games. Various online slots reviews also offer a free to play option for the players to try the game. For the 243 ways to win to be possible, the winning combinations are formed by landing the matching symbols on at least three adjacent reels beginning from the leftmost reel. What helps you do this is the two-reel feature. On every spin, the two adjacent symbols will be picked randomly and the two reels will feature similar symbols on that spin. Hopefully, the tween reels can expand and turn from three to all the five reels into matches and in the process, this can lead to potentially awesome results. The most sought-after 1000 coin jackpot, described earlier, can be won only when five diamond symbols appear on the active pay line. The game does not feature any free spins, cash trails, pick me rounds and any other traditional bonuses offered in the casino games. The whole gameplay majors on the root game which relies on the Twin Reels feature. Getting identical symbols with at least two reels might seem to be a straightforward affair to getting winners. It`s not as easy as you might expect it to be. What you can expect is lengthy spells with near misses causing frustrations, but you can land a better expansion from the two-reel feature to possibly win some bumper payouts.